Rhinoplasty or nose reshaping is generally quite safe when performed by an experienced surgeon on a properly selected patient. Prior to any surgery, it is crucial to understand the risks involved, what consequences the risks might have on your life, how risks occur and how they are managed. Top revision rhinoplasty surgeons are sensitive to what you’ve been through, so they place a great emphasis on making sure you’re prepared for your corrective surgery. Although you can never reduce the rate of surgical risks to zero, choosing a highly qualified rhinoplasty specialist can greatly minimize the incidence of complications just as the likelihood of a disappointing result. When complications do occur, an expert rhinoplasty surgeon has the experience, expertise and judgment to provide prompt and effective treatment to preserve a successful outcome and hopefully minimize negative consequences. The best surgeons know that the more you’re informed about realistic surgical risks, the better. In fact, the way a rhinoplasty surgeon handles the discussion of risks can help you evaluate their trustworthiness and expertise. If you meet with a surgeon who glosses over surgical risks, or doesn’t explain clearly, your “trust meter” should go off. Cross that surgeon off your list. Good surgeons know that it’s only by understanding surgical complications and risks that you can make an intelligent and informed decision to go forward with surgery. Most experienced revision rhinoplasty surgeons find that the more you know about risk, the more thoroughly you understand the proposed procedure and the lower your anxiety level will be as you contemplate surgery. Your calm and confidence lay the groundwork for a successful surgery and quick recovery, so being forthcoming comes naturally to the most talented surgeons. 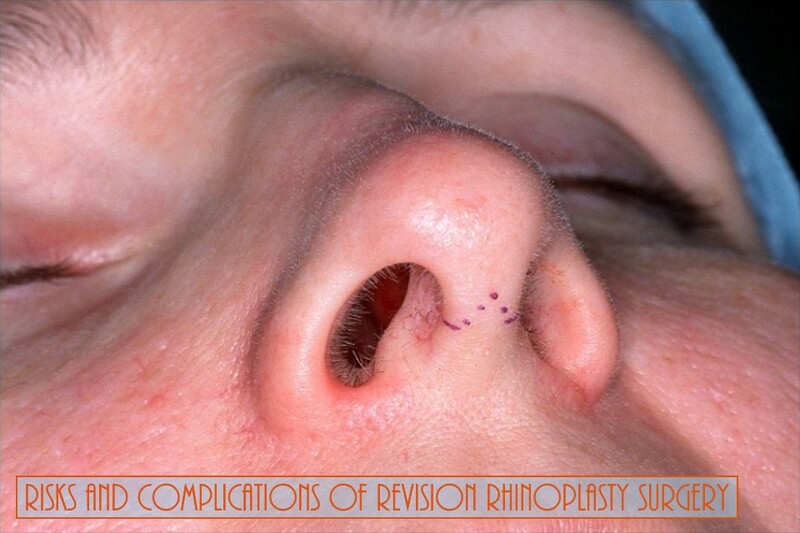 Although higher than in primary rhinoplasty, revision rhinoplasty overall has a low rate of complications. Individual surgeon’s results may vary widely, however. That’s why it is important to find an experienced surgeon with superior surgical judgment and meticulous technique, honed over years of specialized practice. From among this elite group, select a surgeon you trust to improve the form and function of your nose with revision rhinoplasty. Bleeding may be the most common risk of rhinoplasty or revisional rhinoplasty, since blood vessels may be damaged during each surgery. Most patients lose a small amount of blood during surgery and a very few may experience significant post-surgery blood loss. In the absence of a bleeding disorder, blood loss almost never rises to the level needing hospitalization or blood transfusion. Usually, nasal packing for 12-36 hours is all that’s needed. Blood thinning medications, even mild ones like baby aspirin, can cause excessive bleeding, so you will be instructed to avoid certain prescription and non-prescription drugs and herbal supplements. Be gentle with your nose during the healing process, since forceful blowing of your nose or bumping the nose can also cause bleeding. Adverse anesthesia reactions are avoided when a highly qualified anesthesiologist administers general anesthesia (typically needed for revisonal rhinoplasty). Top surgeons work with only the best anesthesiologists to ensure patients are well cared for and properly monitored throughout the rhinoplasty procedure. General anesthesia involves both intravenous medications and an airway-protecting breathing tube. A physical exam prior to surgery to make sure your health is good and the investigation of any prior anesthesia reactions that you or your family members may have experienced helps forestall any problems. Nasal blockage or the sensation thereof can occasionally occur. As your nasal contours are reshaped, changes may need to be made to the septum and, in some cases, the overall size of your nose may need to be reduced. There will be initial swelling and numbness that may contribute to temporary breathing difficulties, which typically resolve as swelling decreases and you become accustomed to your new nose. In some cases, the nasal septum may be perforated or a weakened nose may collapse. Impeccable surgical technique and proper patient selection usually prevent these major problems. Scar tissue from initial and/or secondary rhinoplasties may narrow the airway. Rarely, a graft may slip out of place and partially block the nasal passage. A careful pre-surgery exam and detailed, well-executed surgical plan can prevent these complications in most cases. Make sure to describe any breathing problems you may have to your surgeon to ensure the most complete repair of internal abnormalities. Infection is a rare risk since the nasal blood supply is fundamentally robust. Compromised nasal lining, prior drug use, scarred soft tissue coverage and the need for grafting can complicate matters. To help prevent problems due to infection, patients are instructed to watch for symptoms, such as a fever, excessive swelling, odorous nasal discharge or pain—and contact their surgeon right away. Dissatisfaction with the outcome is a risk that can be minimized with clear surgeon-patient communication and a meticulous well thought out plan prior to surgery. Unrealistic expectations are managed by a straightforward surgeon who honestly explains the improvements that can be achieved with corrective surgery. The corrections depend upon your desires/expectations, the quantity and quality of remaining tissue and structural support, scar tissue from prior surgery, the thickness and elasticity of skin and many other variables. Make sure the result your surgeon describes matches closely enough with your goals—and that your goals are realistic—before going forward with surgery. The best plastic surgeons, including revision rhinoplasty specialists and reconstructive surgeons, are committed to ensuring that you understand all risks clearly. If, for some reason, your surgeon feels that your risks outweigh any benefit that revision rhinoplasty might bring, he or she will explain that you are not a good candidate for the procedure. Sometimes this is only a temporary problem, for instance, your surgeon may feel that you need more time to heal from your prior procedure. In some cases, the nasal structure may be too early in acute healing phase to attempt a second or third rhinoplasty. Given proper timing, improvement can be made in the majority of cases. There are even some revision procedures that require only minor surgery. Don’t become discouraged–be sure to seek a professional opinion if something about your previous rhinoplasty bothers you. Choose an expert surgeon with a background in reconstructive surgery. Make sure your surgeon has years of experience and focuses a significant part of his or her practice on rhinoplasty/revision rhinoplasty. Experience builds good judgment; your surgeon needs to know what to do should a complication occur. Find the go-to revision rhinoplasty surgeon–the one to whom other surgeons refer the toughest revision rhinoplasty cases. Discuss risks and complications openly with your surgeon, making sure you completely understand what’s proposed. Ask about the rate of complications in general and those that your surgeon has encountered. Learn about your surgeon’s plan to avoid complications. Choose a surgeon who communicates openly with you. Choose a revision rhinoplasty surgeon that you trust. Follow all instructions leading up to your corrective rhinoplasty surgery and during recovery. Call your plastic surgeon if you notice any of the post-surgery warning signs you’re instructed to watch out for or if something isn’t quite right. Contact your surgeon day or night if you have concerns during the healing process.